Since he is born, you and your child will embark on a journey that will go from him grabbing your finger to climbing on the playground. Your child will astound you with his every day achievements and, as you move through the stops on this journey, you’ll see not only his physical abilities thrive, but also his growing independence and confidence. Keep reading to learn about every stop and landmark you’ll encounter on this trip! Although independent steps might happen close to your baby’s first birthday, your little one has been on the developmental pathway for the acquisition of walking since he was born. Every effort, body adjustment, and struggle will help him waltz through every one of his developmental milestones and steer him to walk and later on run, climb, and jump. Here’s a map of his journey and specific recommendations for each stage. As you begin this journey with your baby you need to remember that, even though it might seem intuitive for us adults, running, walking, standing, and even rolling requires a whole set of physical skills. Every effort calls on his motor planning, balance, coordination, and attention abilities. Keep in mind that every baby develops in his own unique way, so while some might encounter these milestones on the clock, others might skip one altogether or accomplish some simultaneously. If you have any specific concerns is always best to talk to your doctor. During this stage your newborn is discovering new things about how the world works every day, and his hands are an endless source of entertainment. Holding lightweight toys like a rattle will keep him entertained for hours. He’ll want to grip your fingers, as well as get some movement on his legs while you change his diaper. Tummy time is a must for him right now since it strengthens his back muscles and helps him gain head control. Bright and noisy toys will make tummy time more enjoyable and you’ll see him start connecting his actions to the movement of the toys. At this stage, your little one is beginning to gain the muscle strength and balance that allows him to sit up. This time is crucial to keep helping him strengthen his muscles. Floor time and bright toys are the best way to encourage him to roll or lean forward while seated. Of course, they are more effective when they come with your kind words and encouragement. You can try supporting his back with a pillow and he’ll love banging objects with you; keep encouraging him to explore. Wobbling is common as he tries to find his balance and make the necessary body adjustments to sit by himself; be ready to catch him! During this time, your little one wants to conquer the crawling position and get moving. The coordination and strength of his arms and legs will propel him back and forth. During tummy time, roll a blanket underneath his chest to get his arms and legs moving. For an all-fours position, a soft flat surface will be more comforting for his knees. The absence of socks and pants will get him a better grip and chasing after mom will be the best encouragement. As he stands up, your child will experience a whole new point of view. Squats will help strengthen his legs, core, and trunk. He will work on his balance to be able to stand on one foot later on! Sturdy furniture can provide a stable surface to grab on, and he’ll be wanting to come up to enjoy the view and coast along. Once he’s up, you’ll need to show him how to bend his knees to go back down. Your reassurance that he is safe will encourage him to keep trying! Once he gets a steady grip, he’ll start cruising around with whatever he can hold onto, so avoid rooms with lightweight objects and sharp edges during play time. 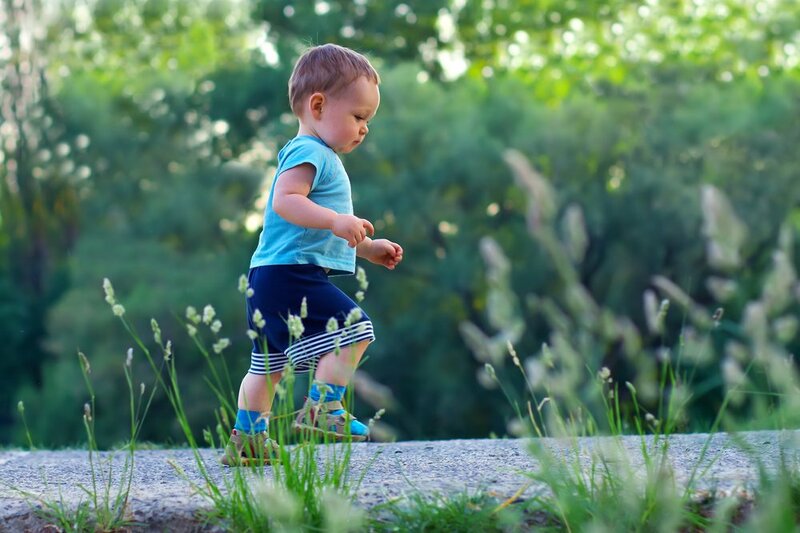 During his first steps he will rely on what he feels, so make sure he spends time barefoot and in soft surfaces every day! Time to walk! During his 10 and 15 months of age, your son will discover a whole new world by taking his first steps. Those tiny moves forward are a huge milestone for your little one’s sense of achievement, independence, and of course motor development. Since his hips and legs are strong enough to carry his torso, he’ll start making attempts to reach objects further away. During playtime, try aligning sturdy furniture in a pathway and making the spaces in between bigger each time. A loving supportive environment is always his favorite, so try sitting in front of your partner and cheer your son to walk back and forth between you guys. Hugs and kisses at each end will keep him motivated! From time to time, organize play dates with friends who are already walking or on their way as well. When walking around, hold his hands and let go of one at a time. Alternating sides will help him gain coordination and balance, for future skills like throwing and catching or kicking a ball. Walk everywhere you can, including up the stairs. Your little one’s running skills are acquired gradually, and greatly depend upon the opportunities you provide for him to be physically active. During this process, your little one will acquire plenty of coordination and motor planning. At first, he will toddle around the house and begin picking up speed. You can practice going around the room chasing each other, give him the space to explore, climb, and balance. Encourage him to jump and dance together. When he’s ready, coach your little one through the appropriate movements when running, like bending the elbows and moving the arms to the opposite leg. Little by little your child’s own sense of accomplishment will have him running around everywhere! Your loving support and encouragement will get him physically and emotionally ready to become quite the sports player. Once he starts with those tiny moves forward, it will be hard to catch up with him!